Rally Racing News Leader in the USA | Rally World News Rally World News: TOYOTA RETURNS TO THE WRC, WELCOME BACK! TOYOTA RETURNS TO THE WRC, WELCOME BACK! Toyota Motor Corporation president Akio Toyoda ended months of speculation when he made the announcement during a press conference in Tokyo, at which the Yaris WRC made its public debut in a launch livery. 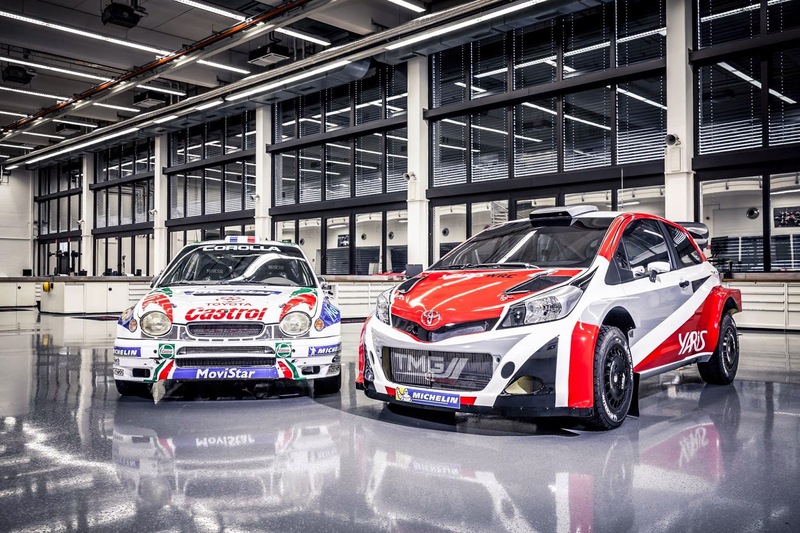 The programme will be handled by Toyota Motorsport (TMG) in Cologne, Germany, which has already completed a preliminary test programme in Europe with the Yaris WRC on asphalt and gravel. Frenchman Eric Camilli, who drove a Ford Fiesta R5 in WRC 2 at Rallye Monte-Carlo, has been selected as the first member of Toyota’s junior driver development scheme. The 27-year-old will carry out the test programme alongside former Subaru driver Stéphane Sarrazin, now a racer in Toyota’s FIA World Endurance Championship squad, and eight-time Finnish champion Sebastian Lindholm. Toyoda said his visit to last season’s Neste Oil Rally Finland impressed him. The Yaris WRC has already started testing “During my time there many rally fans asked me when Toyota would come back to WRC. People talked about Toyota’s history in WRC, and I was filled with surprise and gratitude that so many people remembered. “Last time we competed was in 1999. That makes me think we are not announcing a return, but perhaps a start. We must begin again from scratch and carefully prepare both team and cars," he said. The current Yaris WRC complies with existing regulations, but changes are expected when updated technical rules are introduced to WRC in 2017. Toyota won four drivers’ and three manufacturers’ world titles in the 1990s with legendary drivers such as Carlos Sainz and Juha Kankkunen. Toyota’s return was welcomed by WRC Promoter’s managing director, Oliver Ciesla. “Toyota has a long and distinguished history in motorsport, particularly in world rallying, and we’re delighted to welcome one of the automobile industry’s giants back to WRC,” he said. .